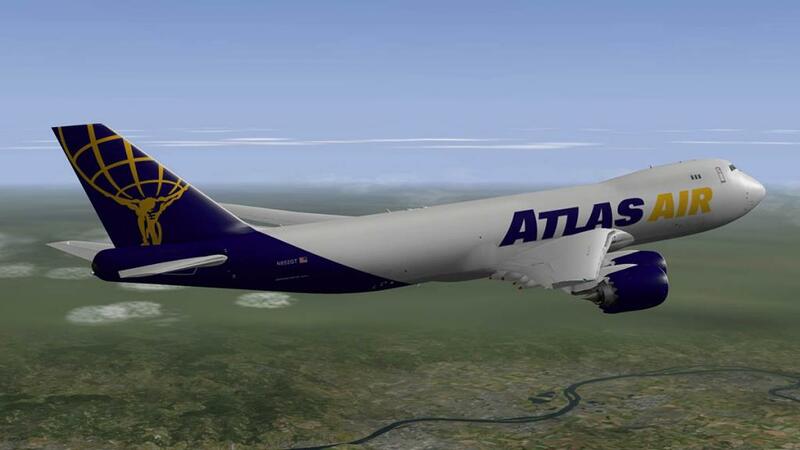 Supercritical Simulations Group have now produced two versions of the latest Boeing 747 Series in the 748i - Intercontinental Advanced and now they have released the Freighter version in the B747-8F. 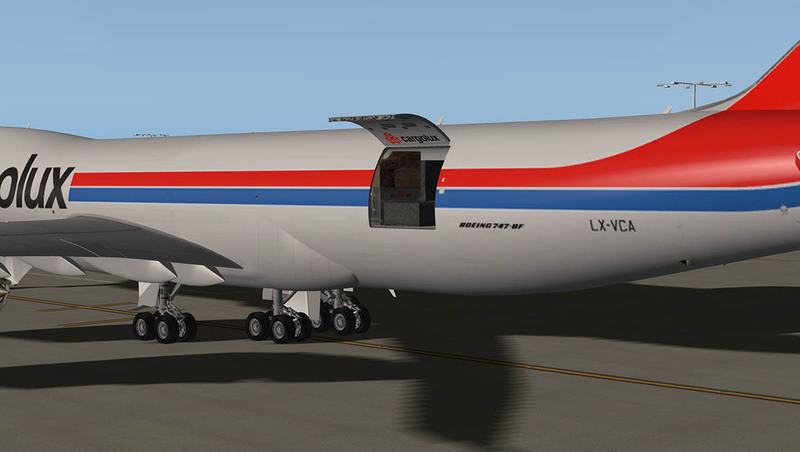 In many respects it is the F-Freighter version that is more interesting in that Boeing are selling the Freighter version almost 3 to 1 of the passenger version, and even those aircraft have been downgraded to 3 per month on the production line. Sadly both the these VLA (Very Large Aircraft) in the B748 and A380 category are struggling to fill any orders. You would think that the cargo masters would want the biggest and most efficient yet freighter on the market, but no they don't. In many ways it doesn't make sense. As the world is more populated than ever before and are set out in these huge mass density centers with limited airport slots, then you would think these aircraft would be an answer to their prayers. But they are not like the original Boeing 747 was in setting the world on fire to aviation and the world in the 70's and 80's. The big twins are filling the market and not these huge transports. But as oil (and fuel) goes a little cheaper then may they suddenly become more profitable and become fashionable once again to their operators. 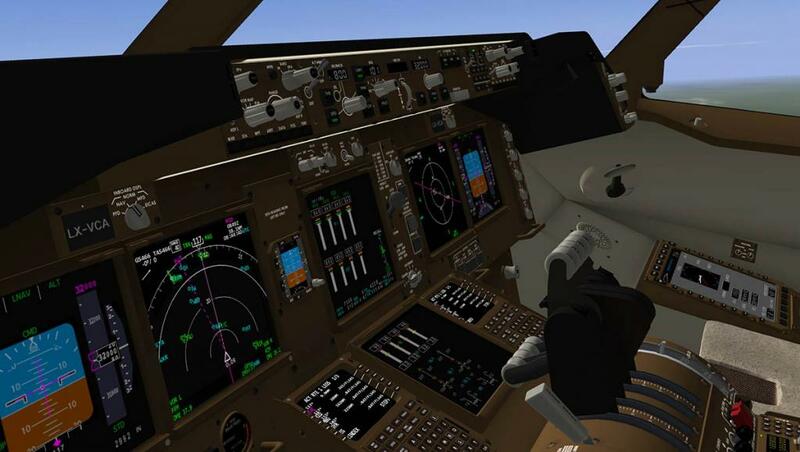 In a strange paradox it was exactly the same time last year that SSG's Boeing 748i was released and I was flying that aircraft hard before Christmas 2013. 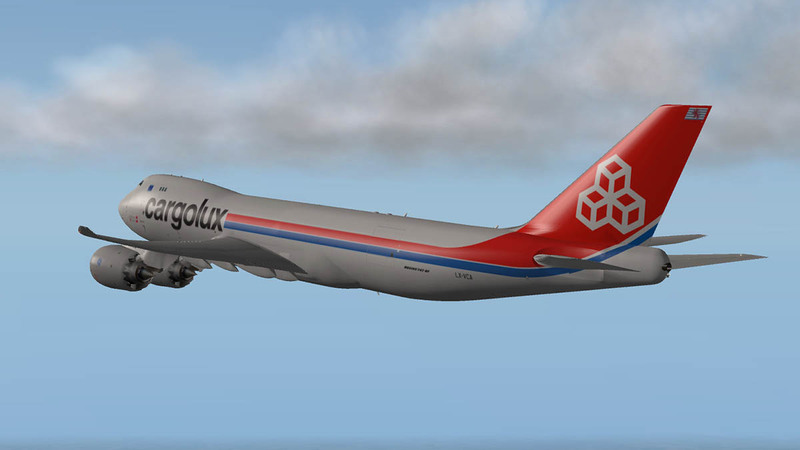 Like a déjà vu, I am again flying an SSG Boeing 747-8F through its paces, but unlike the version last year this aircraft has had a full year of development behind it and that certainly shows here. 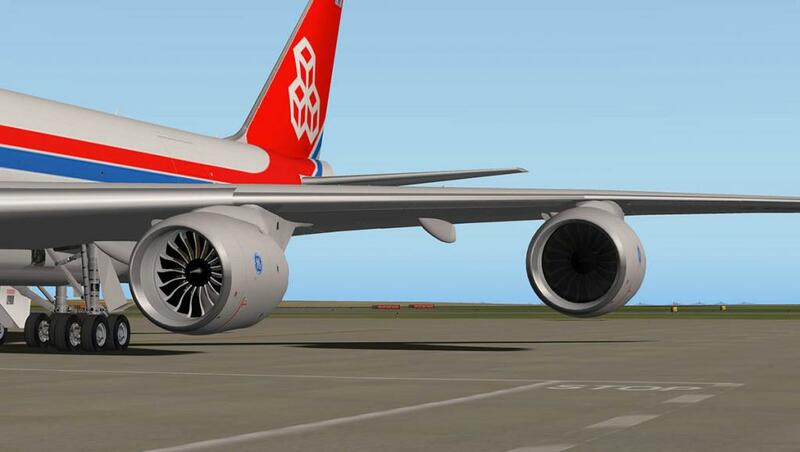 As a more rounded and complete aircraft is one of the things you love about it. I will hand on heart be honest and wish that this variant in the Freighter had been released first. I like the B748i for its long routes, but it is the freighter version that gives me far more scope for adventure and cargo business. I like the routes from Singapore and Hong Kong out to Anchorage, then over the top to Europe, Or Dubai out to either the East or west to Europe. North America down to South America have had a few runs as well. 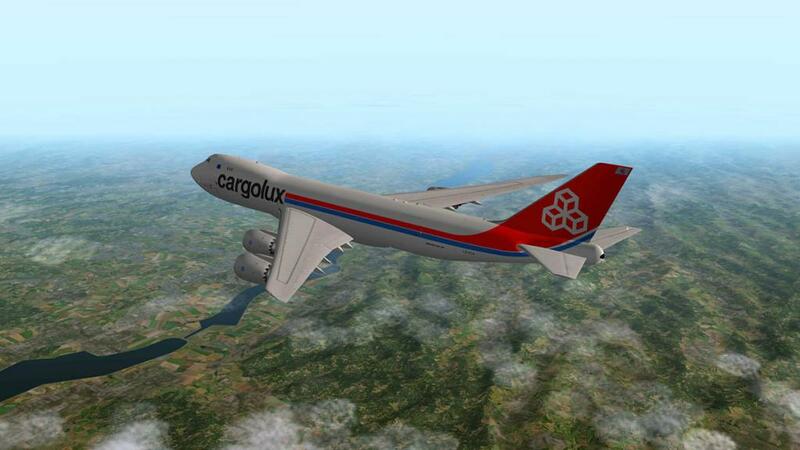 Then there is my usual F1 flying to take the Formula One cargo to the flyaway races. 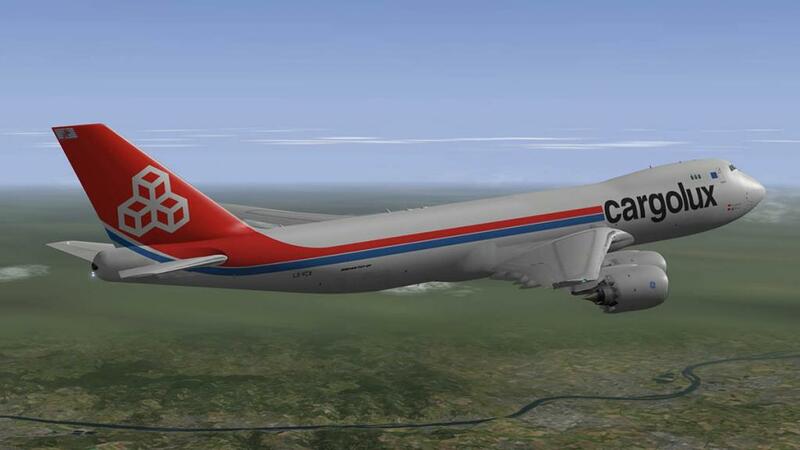 The Boeing 747-8F would fill in very nicely many of these routes and I missed it and its range this last year. That should be put right in 2015. 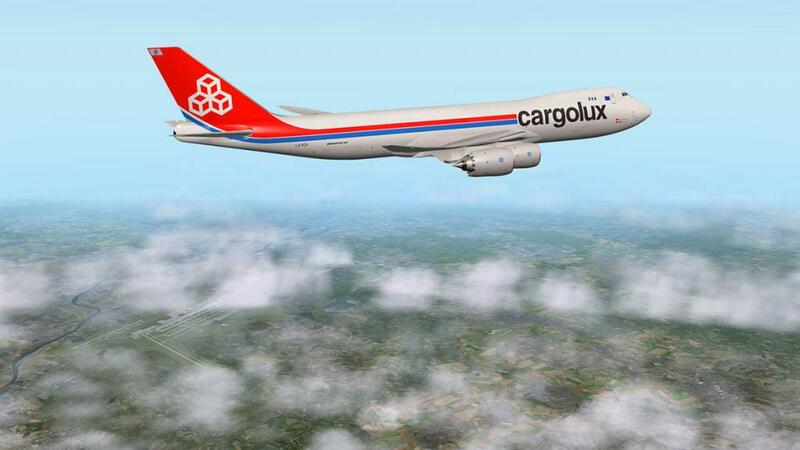 But what we are looking at here and the focus is on the Freighter option. The aircraft is different from the B748i in that the high forward fuselage is like the original Boeing 747-100/200 in that the bubble behind the cockpit on the upper deck in more shorter and more 747 than the long top deck cabin look of the B747-400. The original version was more of a fighter jet look in profile that was sorta lost in the later versions. I loved the original look of the B747 as from certain angles it was simply a very commanding aircraft to look at, and here that pose has thankfully been returned. 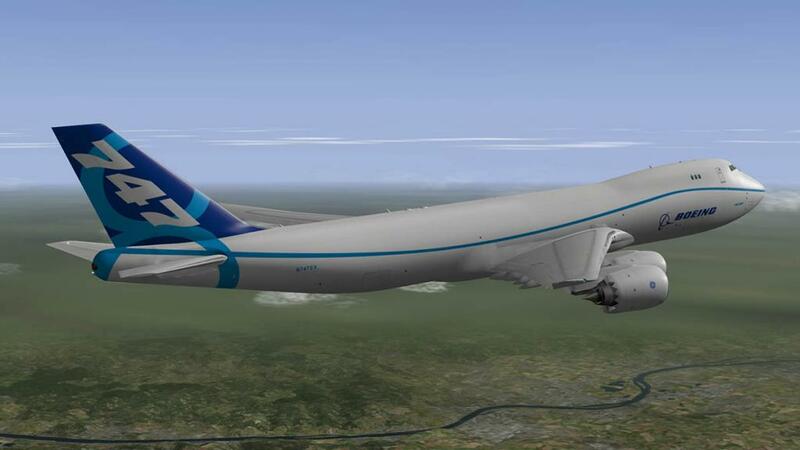 In development the Boeing 747 was originally created as a big logistic lifter for the U.S. Airforce (The contract went to the huge C-5A Galaxy) as the CX-Heavy Logistics System (CX-HLS) in March 1964, and the cabin or freight deck was to be a complete open space for loading and unloading of cargo, that is why the cockpit is positioned above on a separate deck. 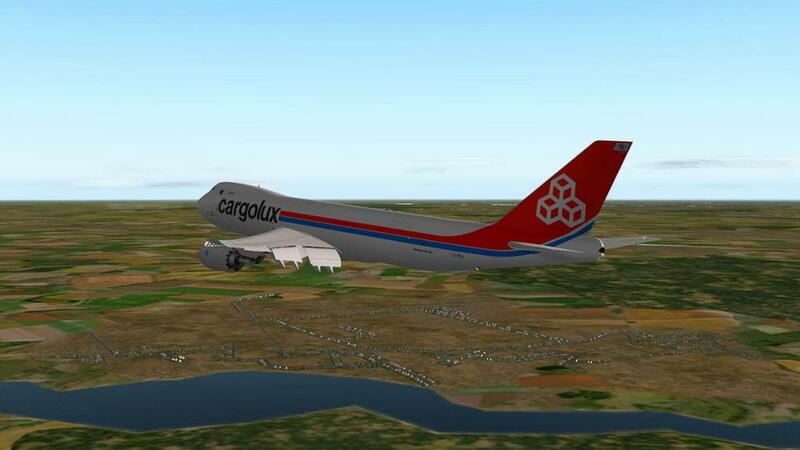 So the cargo version is in reality the original design and production 747. The huge nose section raises up to reveal the large volume of space available for cargo. This aircraft is a cargo haulers dreamboat. 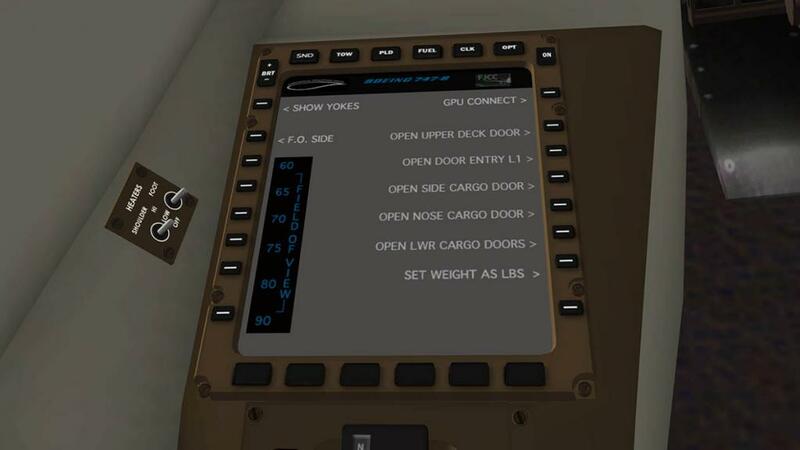 You open the large nose door and any other door including left side cargo door, lower hull cargo doors, and main entrance doors via the menu on the pilots right hand side. The doors and the APU are located on the options (OPT) page. (turn the menu on via the "On" button). The nose does not just appear opened but can take a fair period to raise up to its full open position. A small thing but I really loved that aspect, if you want realism then that is a perfect start. 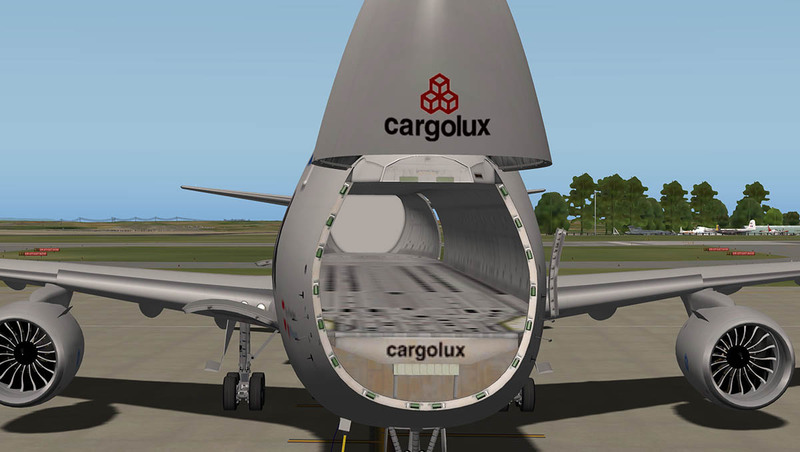 Carrying cargo is our business, and to fill your aircraft with the weight and amount of required cargo is what makes the business run. And here SSG have given you the perfect solution to get the job done. 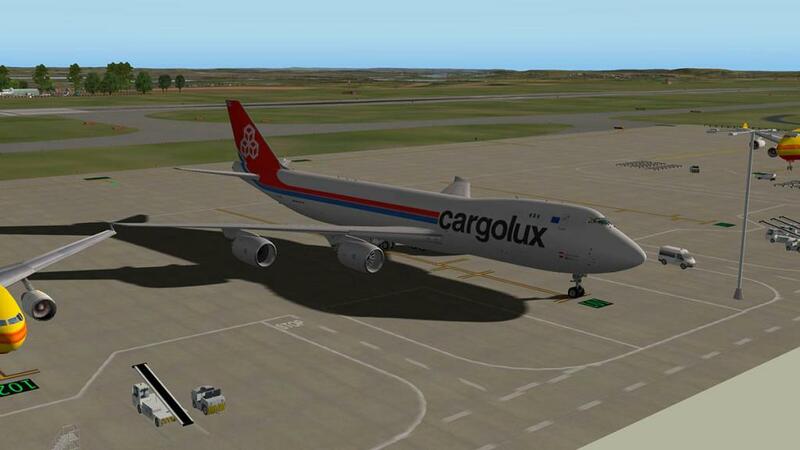 Under the menu "PLD" is the "Cargo Load Assistant" that gives you a large list of options on how to load the aircraft. If you don't want to spend hours agonising over every little KGS then you can select a % of the load in 25% - 50% - 75% - 90% and 100% load factors. 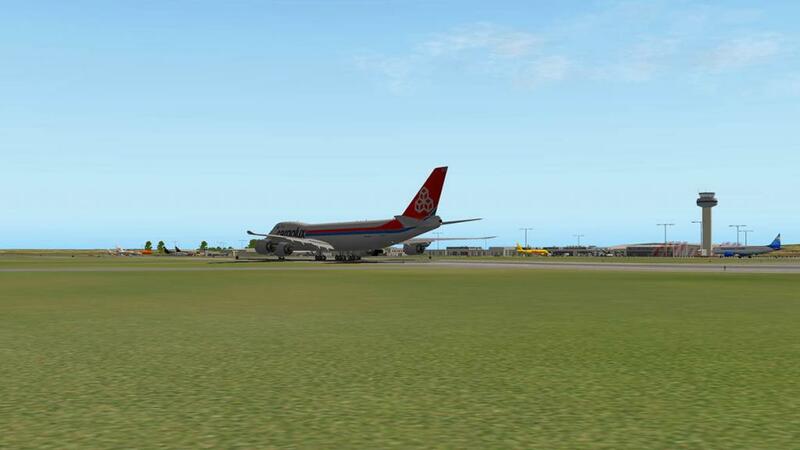 I selected the 90% as that felt realistic and pressed the "Load Aircraft" button to load the aircraft. 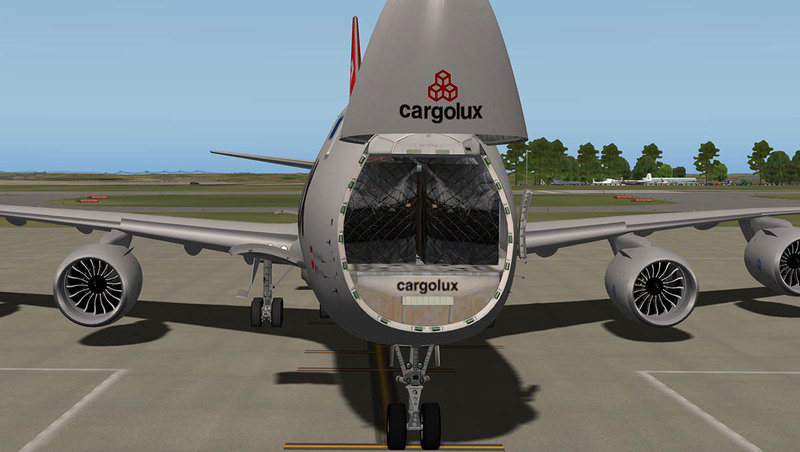 When done you can see your cargo loads through all the doors on the aircraft and the cargo weight is noted as well. 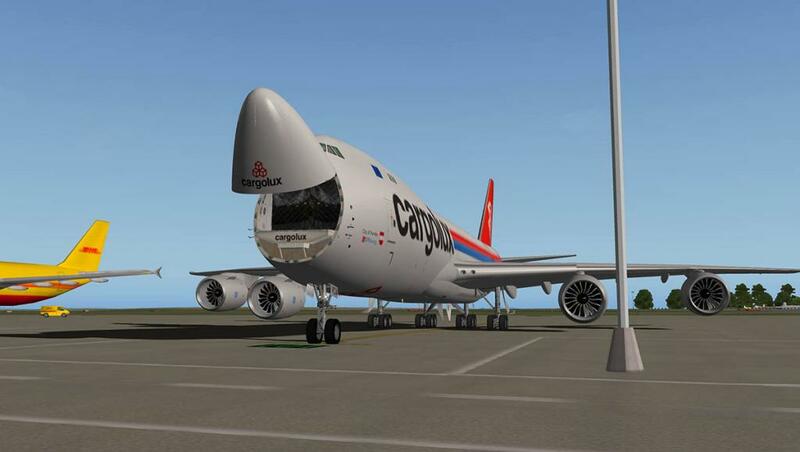 Certainly this set up is the best in the business for X-Plane at this point if your a big hauler fan like me. Your fuel is best loaded in next. Again on the Menu is a fuel page "Fuel" that allows you to load the aircraft's fuel load the way you want in KGS x 1000 (lbs is available). The load can be set (loaded) manually but is best loaded via the FMC option. 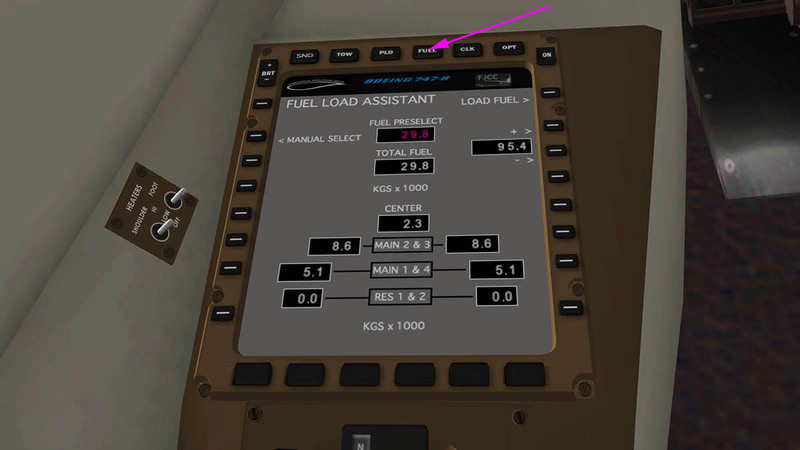 To load the selected fuel then press the "Load Fuel" button. 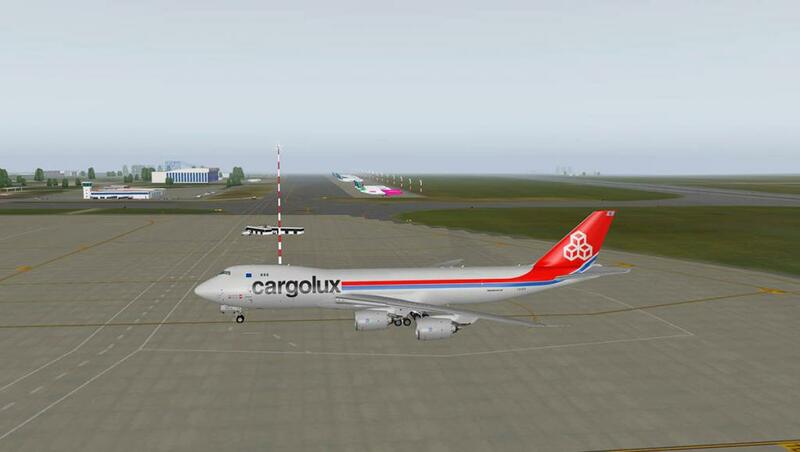 The cargo (and aircraft weight) and now the fuel load is reflected on the FMC. 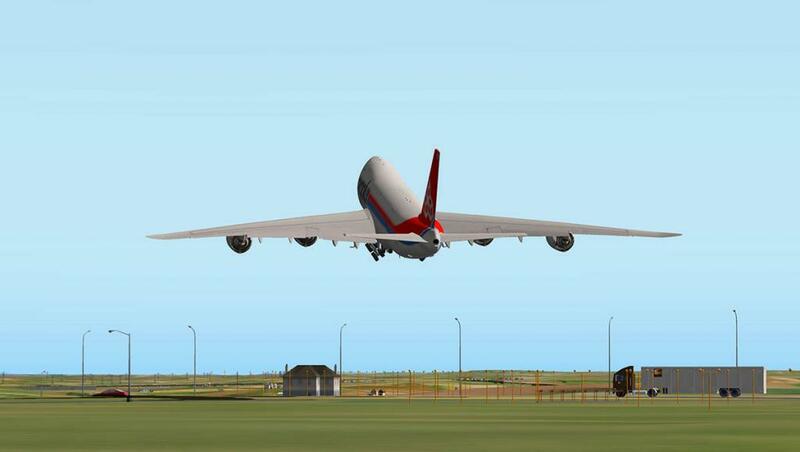 It is best to load the cargo and the fuel in first because if you do change later then you will just have to totally redo your "Pref's" or takeoff and landing preferences as they are related to the weight of the aircraft in MGTOW (Maximum Gross Takeoff Weight) that is limited at 875,000 lb (397,000 kg) and 65,000 lb (29,000 kg) MTOW increase over the -400ERF. 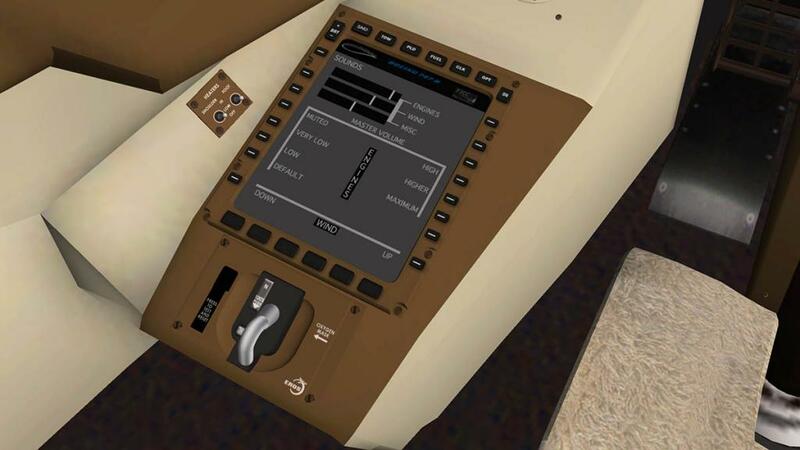 The FMC's (Flight Management Computer in Boeing speak) in the SSG B748i and B748F are from Javier Cortes. 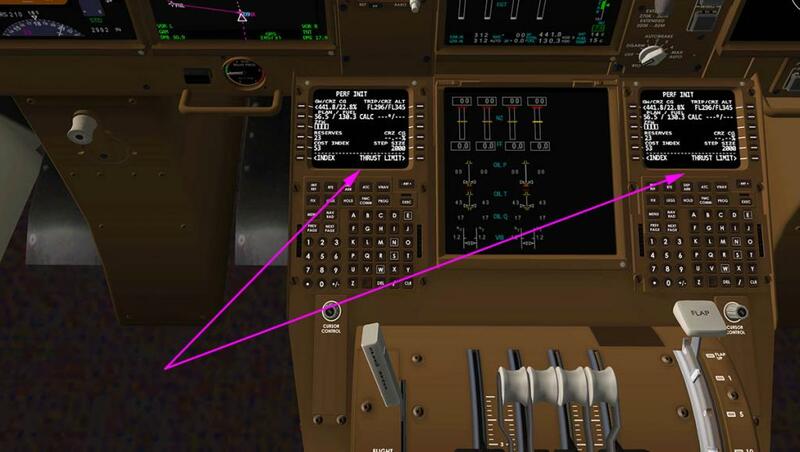 This is an adapted version of his successful "UFMC: Universal Flight Management Computer" plugin. 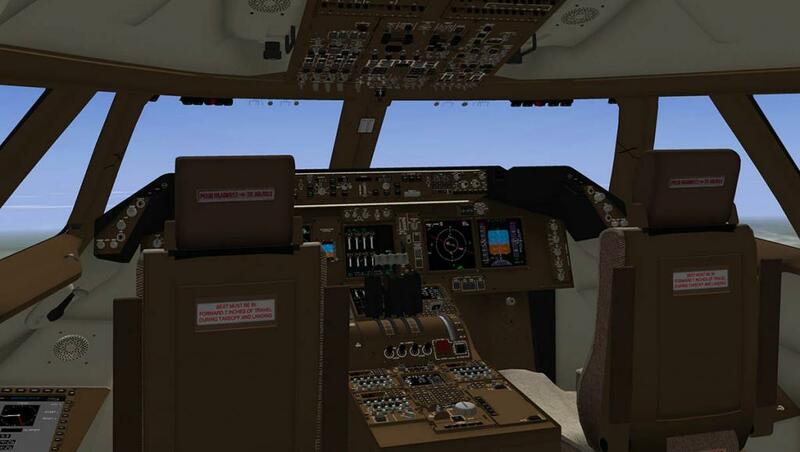 It is a fully accessible in the B748i/B748F FMC including SID/STAR and route management and aircraft takeoff, cruise and approach preferences. 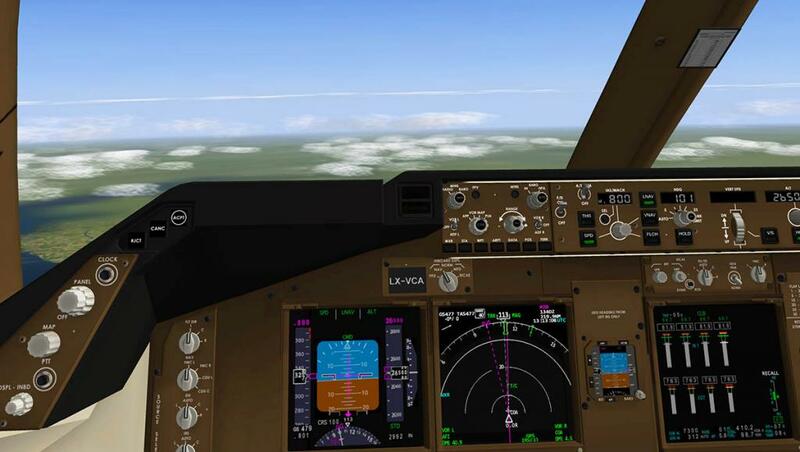 This adapted FMC was not quite developed in the original release of the B748i and throughout the year Javier has done continuous work to bring the FMC up to a very good aircraft management system. 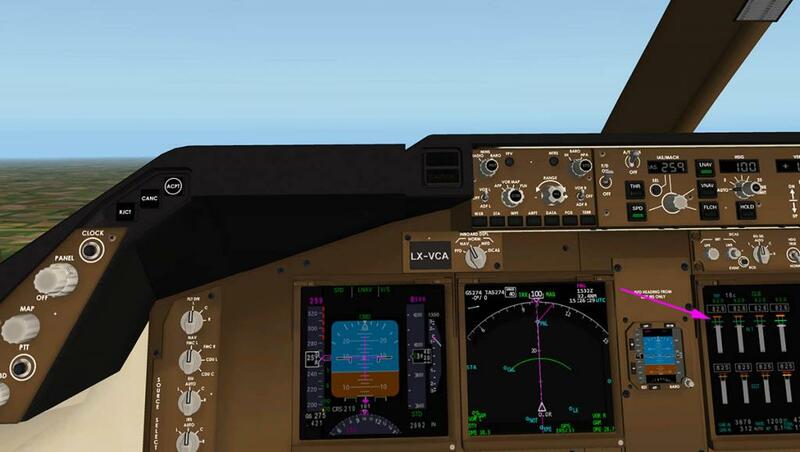 Part of the issues were that the B748i is a very complex and highly systematic aircraft than the Universal type of plugin version, and to Javier's credit it is now a very good FMC. But some niggles still remain that I found in here last year. I will note they could be Mac (Apple) related or just me? 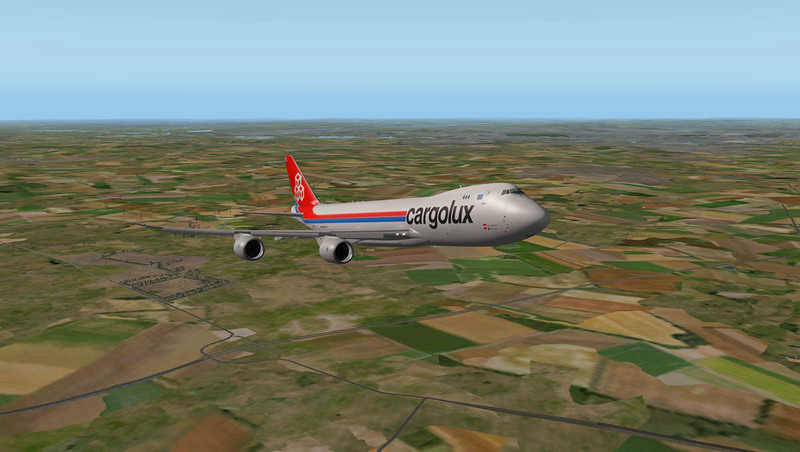 But they are still there when programming in the route from EGNX (Nottingham East Midlands,UK) to LROP (Henri Coanda International, Bucharest, Romania). 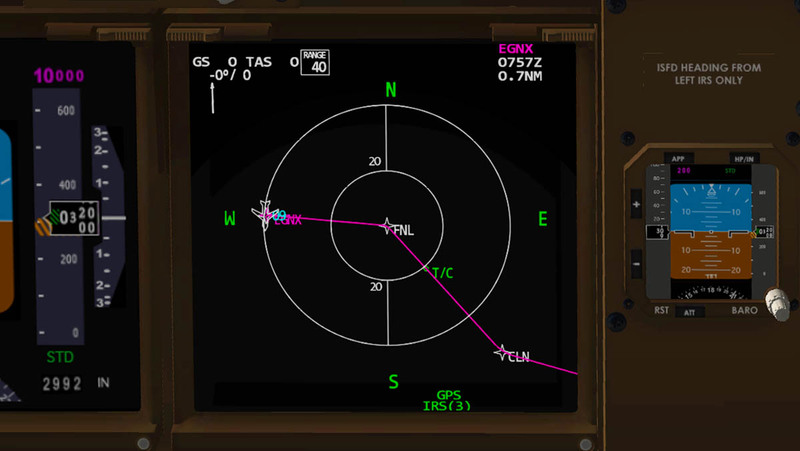 I found the SID's entry still did not work, so I created my own departure route from EGNX from charts (which was not hard) after noting the departure runway, and the STAR entry worked fine but I still found I got that long line off the MAP display to a final waypoint (arrowed) that did not exist after the airport runway and holding track? If I saved a route, and if I reloaded or loaded that route into the FMC my screen would freeze (I can still enter anything into the FMC scratchpad?) So I always have to enter any route from the start to finish. These niggles aside I found the FMC easy to programme and use and very easy to set up a route and activate it ready for flight. There is also the AirFMC app for Apple’s iPad that was developed by Haversine available from the App store and is priced at US$13.99. Which is a bit pricy for the one or two aircraft here, but if you have the x737 737FMC, CRJ-200, A320neo (JARd) or the X-FMC. It will run the iPad on all of them, so that would make it a better consideration. I tried connect up to the B777/B757 iPad app, but it didn't work. 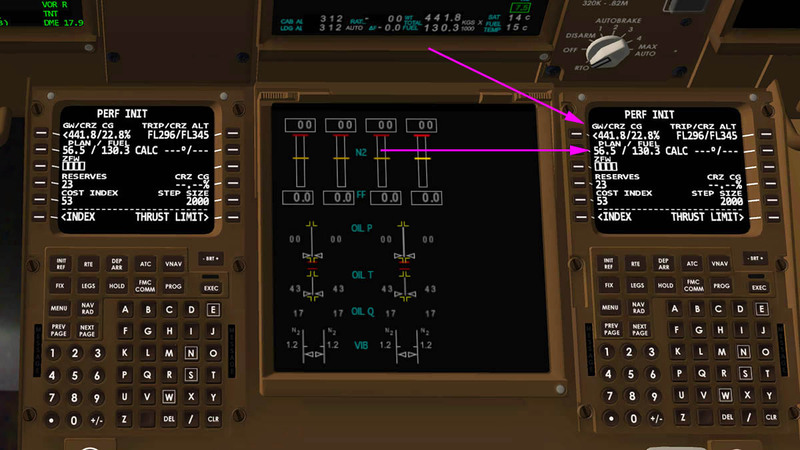 Both MAP displays from the Captain and F/O can show the different aspects of the route in MAP and PLN (Plan) mode and range, which I like in flight. 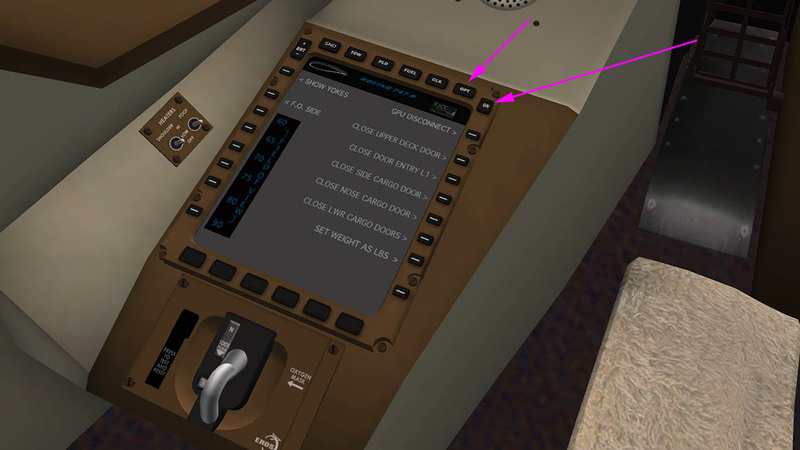 The menu also gives you a "Clock" Function (CLK) that notes ETA, Local and UTC times, plus your weight and fuel flow (when the engines are running), you can reset the elapsed timer. 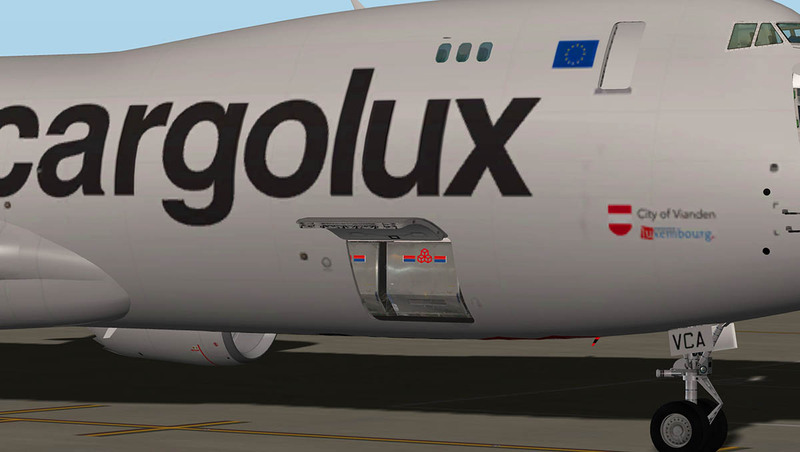 Closing up the aircraft is done again by the "OPT" menu and you are ready to go. Put the MAP display range down to 1 and you get a layout of the airport... which is extremely handy with an aircraft of this size. 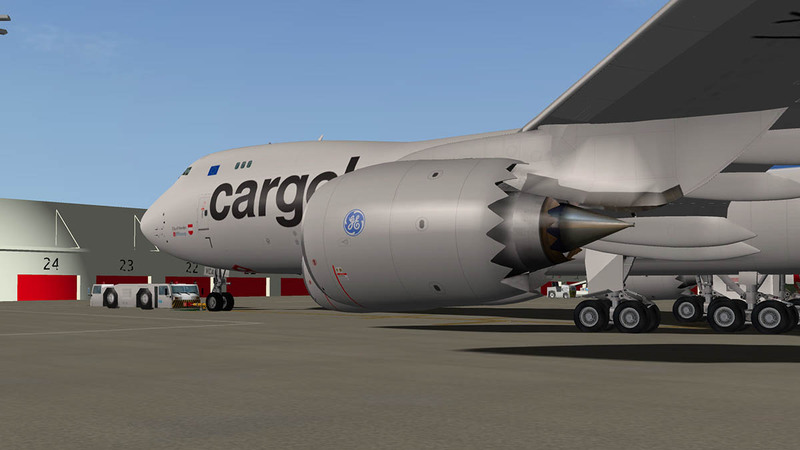 APU running and I start both engine 1 and 4 to provide power to the aircraft but not too much thrust so the push-back truck has to struggle in pushing all that weight and the idle engines (it saves time on push-back as well). Engine startup now is very well done (unlike the original last year which was average), as slow blade animation becomes a blur to a slower blade in the background looks extremely realistic, sounds great as well with the new "DreamEngine" sound set that gives you the full GE GEnx effect which uses some technology from the huge GE90 Engines that powers the B777. 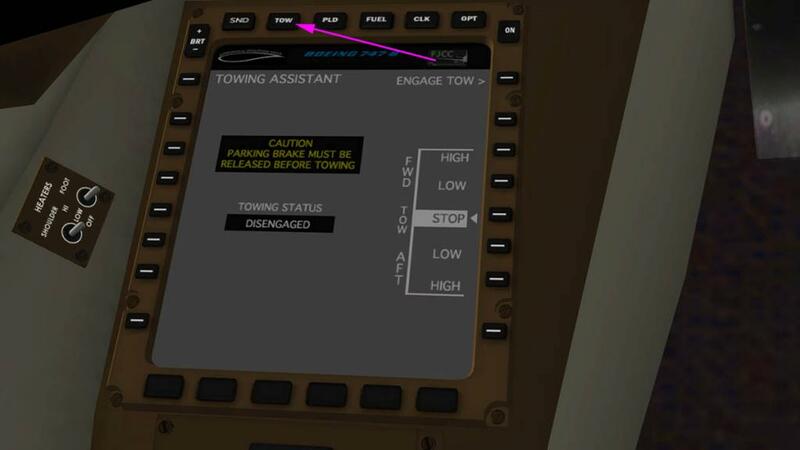 You can set your takeoff preferences (Prefs) and thrust limits via the FMC. 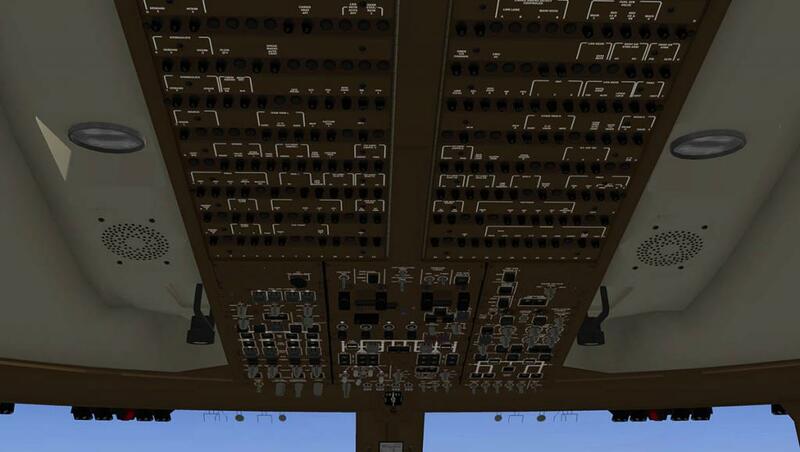 And you are ready after clearance to push-back. There is a built in Push-Back Truck that is activated by the "Tow" page on the menu. You can push or pull in two speeds of "Low" and "High" (I found low to slow) and the truck is what I call a "truck on a stick" as the whole assembly turns in a rigid manner that looks quite awkward, but does work very effectively. You have to provide a fair bit of thrust to get all that weight moving forward, but once doing so the aircraft is quite easy to taxi. 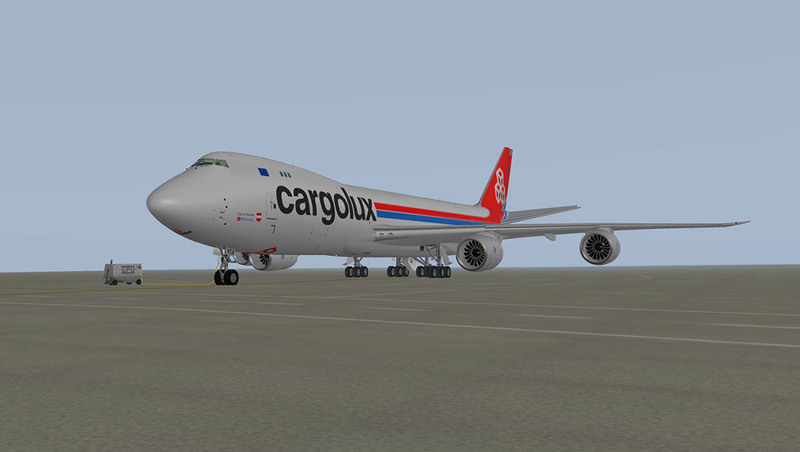 It needs to be as this aircraft is very big to taxi around most airports, routes must be considered with areas that you can actually turn around in, but the turns the aircraft can do are quite tight, with that little extra thrust to keep the momentum correct. After runway hold and clearance it is time to line up and push up the throttles. EGNX in 9/27 (9459ft) has the worse bumpiest runway in X-Plane! It's a pain as you have to have the "runways follow terrain contours" box checked as if not you get that flat table top "lost World" mountain effect. So you have to suffer it and the hard continuous crashing of the undercarriage and pray the goods in the back are not totally destroyed. 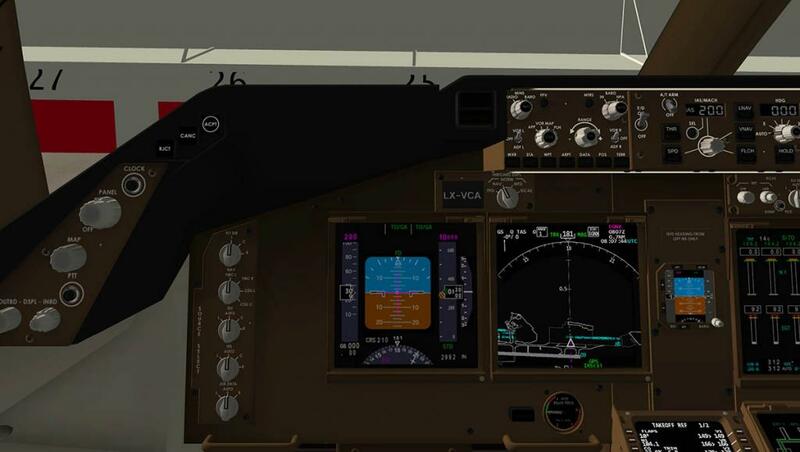 Vr (rotate) is noted at 166knts+10 but I need almost 180knts to still clear the runway, I have eyeballed the end of a few runways trying to get the lift and only a slight pitch (3º) to get airborne in a cargo 747(200), But I have the sheer power here available and once clear the B748-8F will climb quite easily at 10º pitch. To lift these heavy aircraft up to altitude, you have to almost coax it up there. 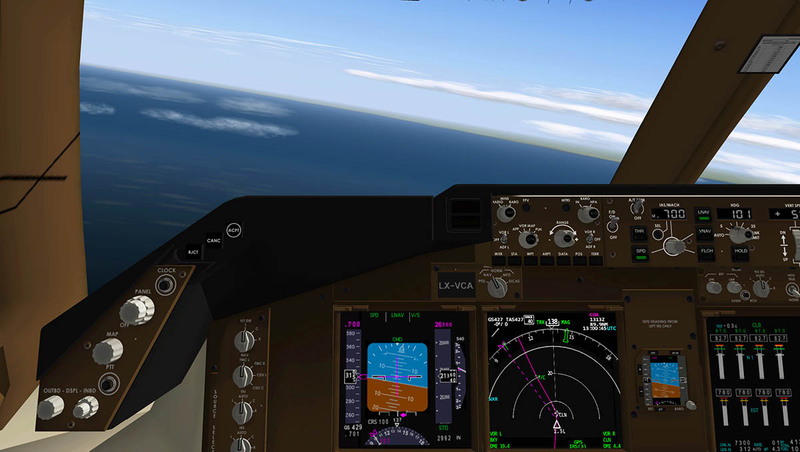 The FMC calculated that FL300 (30,000ft) was the best cruise altitude. So I climbed to FL265 and then stepped the last few hundred feet. You eyes are on the N1 outlet dials, you need a margin here to get you out of trouble, so keeping a gap of 10%-15% is always a nice feeling, In this case I climbed hard to FL220 at 1400fpm V/S and then 500fpm V/S to the first flight level. The steps were at 300fpm. I will note that I made two complete flights on this same route... The one recorded here is the second. 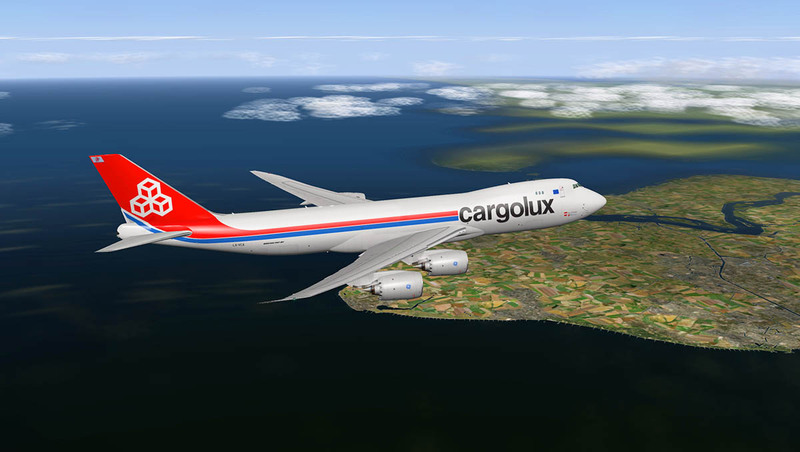 On the first flight I climbed the aircraft at just under 290knts to m60 (mach) as sometimes I do with a very heavy freighter, the point is to keep your speed low to lift in the vertical speed and not to run out of puff from the engines. 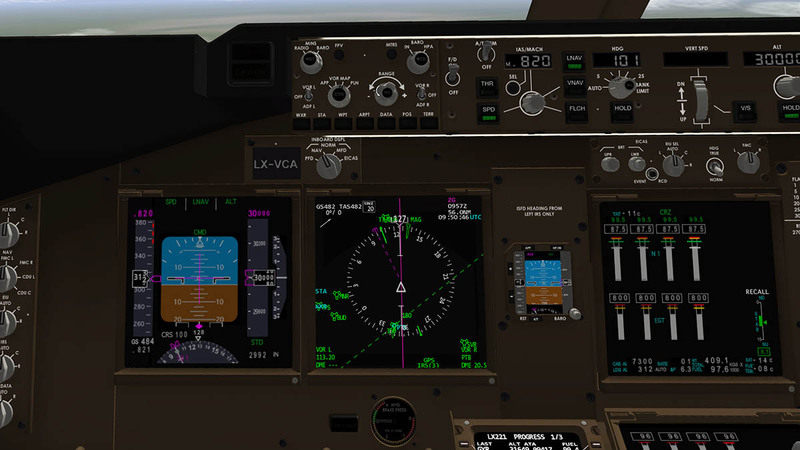 But here in the B747-8F it created a pitch of 7º to 10º that I could not dial out later at 5º even when I had the cruise speed of m80. The point of course was the slow speed. In the second run I increased the speed to 310knts and m65 and that reduced the pitch nicely to 7º to 5º and then 3º in cruise. In both flights I did a transition altitude at 8500ft from the runway (09) at 250knts to clean up the aircraft and change the speed settings. I found it just very hard to adjust out that 3º pitch in flight (and that was the best result of the two flights). The FMC does adjust the CoG (Center of Gravity) in this case 22.8%. But the aircraft flew very nose (pitch) up on both flights? It just didn't feel right or comfortable and come to the approach/landing phases I found it hard to keep the nose down. 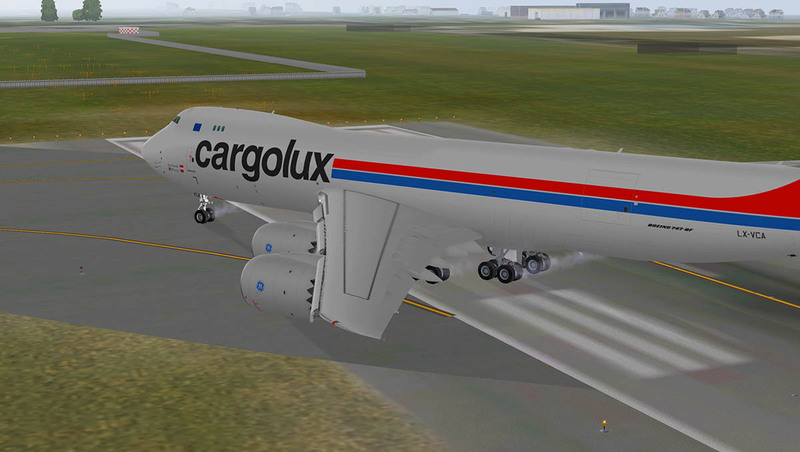 I tried to adjust the CoG in the X-Plane "Aircraft" settings but they don't allow for adjustment there. I did a final very short flight up to FL300 with no payload, and I got a 2º pitch which is fine. 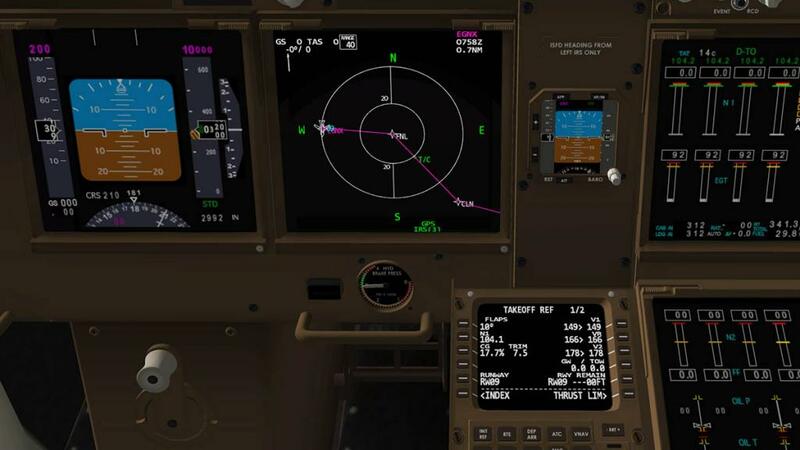 The auto-pilot is excellent and the if you adjust the bank (I like 10º manual) then the aircraft will do perfect turn as noted on the MAP display, just pull the range down to see the turn curve. The cockpit is supremely appointed now. 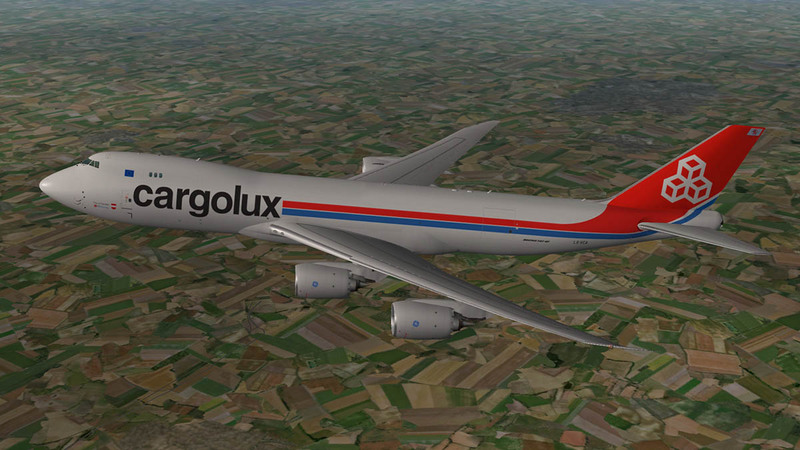 The average bland textures have been replaced long ago in the B748i/B747-8F SSG aircraft. And you don't worry now about spending those long hours up here over distances that can take over 10-12 hours. Everything is now working and adjustable. The aircraft has the v1.1 improvements of the B748i in the hydraulic system has been improved, and unpowered control surface behavior has been added, fixed the “Recall” button and message logic, added is new seat belt sign logic, the braking system has been improved for XP10.30 and many of the flight dynamics have had improvements. The MAP function gives you three options by pressing the middle (CTR) of the Map select knob. One is the standard MAP view with weather distance bands, another is a ROSE, which I usually use the most in areas of adjusting the aircraft's heading in manual takeoff/landings or flying VOR. And a third option with a altitude display on the bottom. All are very good but I didn't use the altitude display that much on these flights. 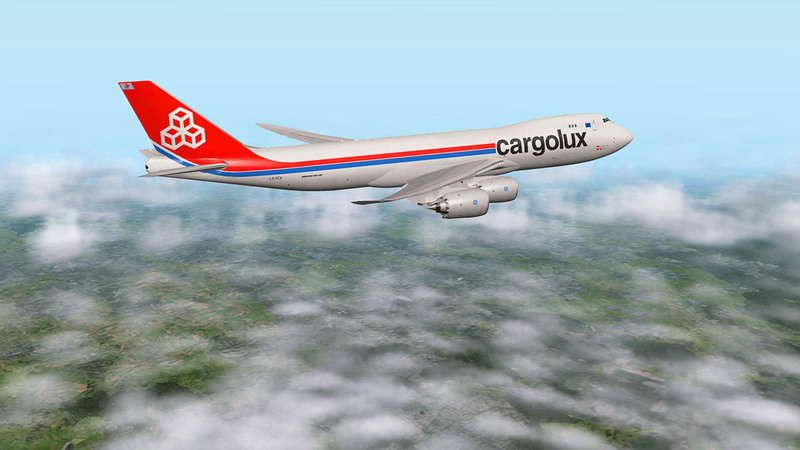 Five liveries consist of one House (Boeing) as default and four cargo operators in CargoLux, Cathay Pacific Cargo, Atlas Air and Korean Cargo. 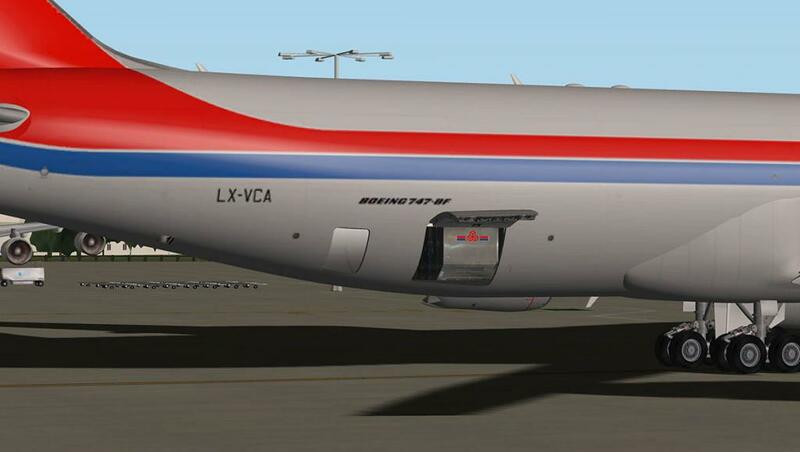 There are two versions of each livery in High and Low Res liveries. I tried both versions and it didn't seem to make much difference to my settings (or frame-rate)? but the quality was very good. Frame-Rate : I am going to note the frame-rate aspect of these two large aircraft because it is not an issue but is theme that constantly comes up. 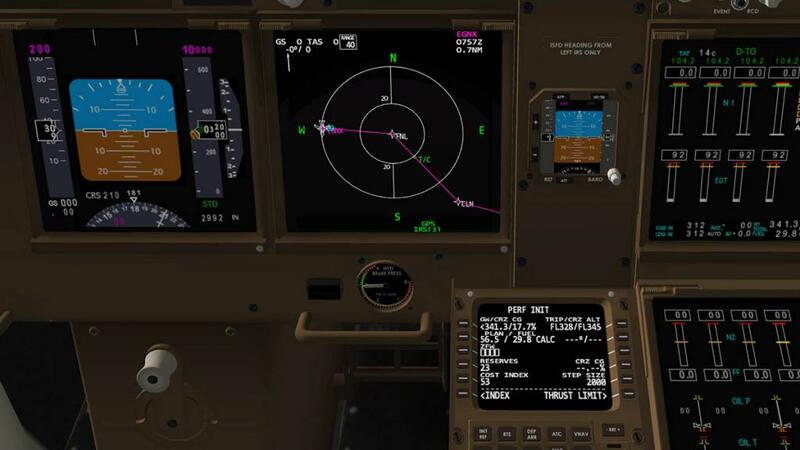 Is the aircraft frame-rate friendly? Well yes and no. In yes, when compared to the release version last year these latest versions are extremely good. SSG notes you need a minimum of 512mb graphic power and 4gb of memory, which I have (6gb of memory). 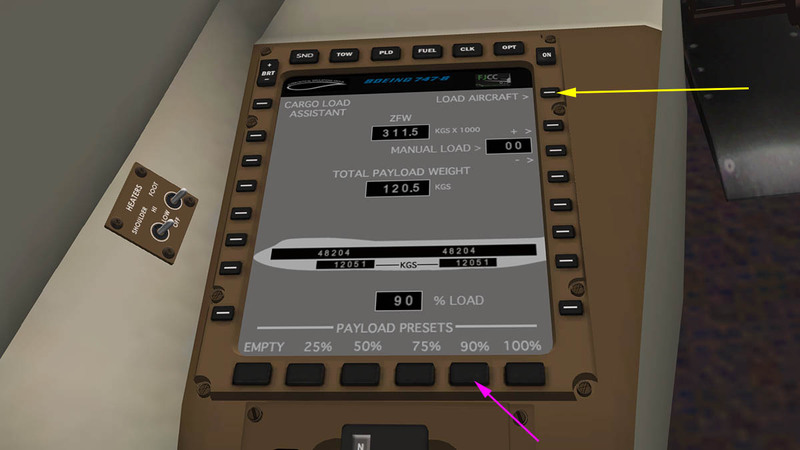 But that is really too low, you need a full 1gb to run this aircraft in a normal load and more memory as I found 6gb was on the line (as noted also by the X-Plane.OrgStore). But that does not say you can't run it effectively. 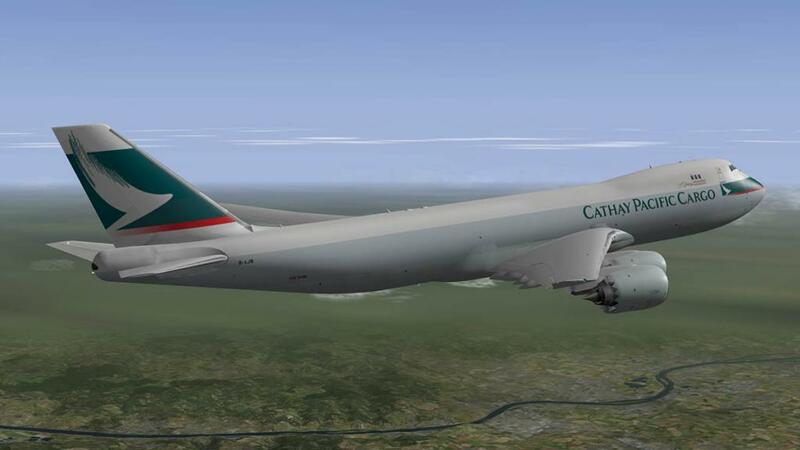 It did take me a fair while to get the right compromise to run the B747-8F mostly by getting the numbers under that 512mb level. The texture setting on normal is the best way to do this and I switch off my "trees" and "draw per pixel" and keep my anti-alias to "x4". 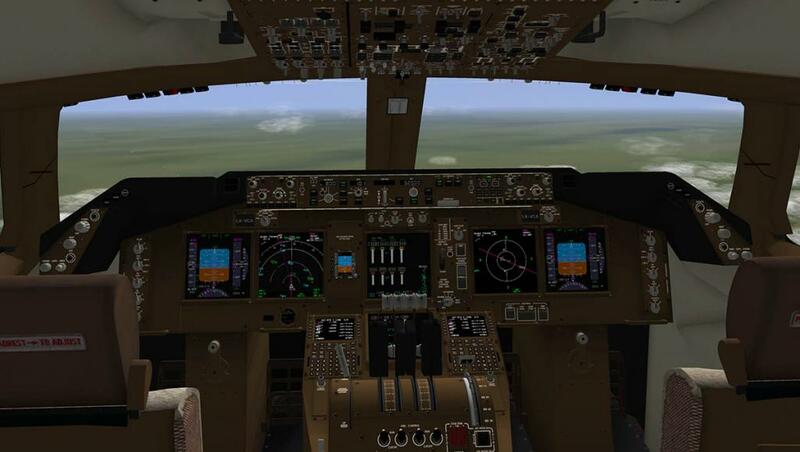 Once done I found the aircraft very steady in the simulator, with no frame-rate shuddering and no shuddering in movement of the views, I completed both routes perfectly with no changes needed to compensate for undue changes, certainly any weather or very large scenery would have had an effect, but both Depart/Arr airports are not over large but still good scenery. 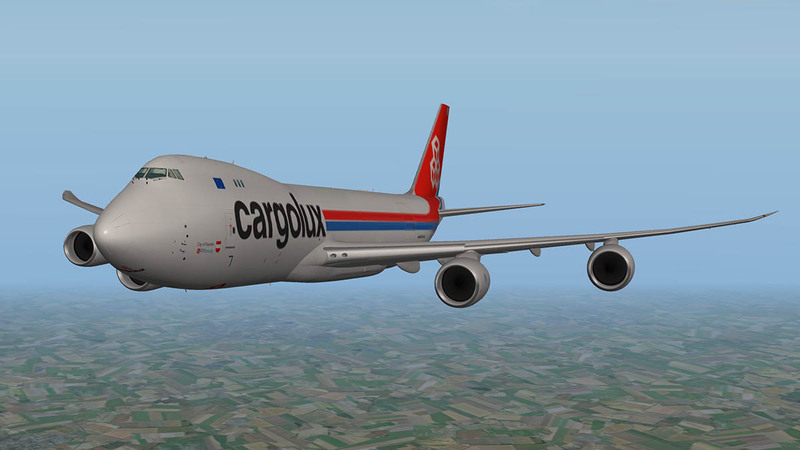 From that aspect the B747-8F was a very good simulation, even by my minimum standards. 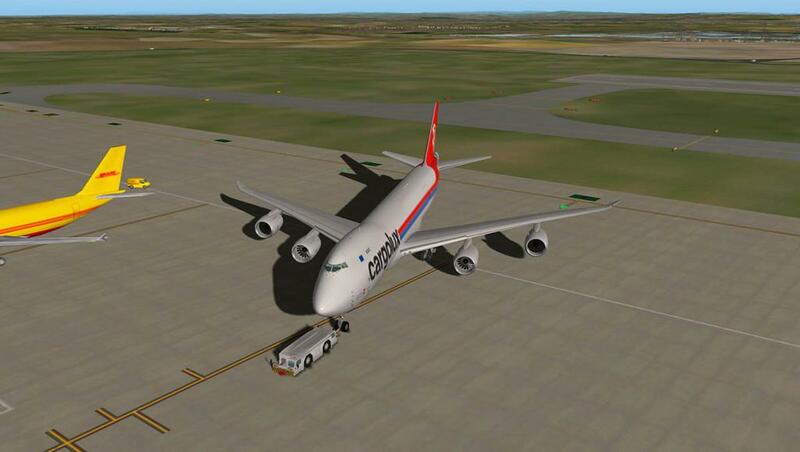 In no, It must be noted that these two VLA's are just that "Big", Loading any of each of these aircraft are going to create a large hole in X-Plane, It is not the actual file size of the aircraft (around 580mb less the liveries) as X-Plane can easily absorb bigger files than that. But the actual pixel size? 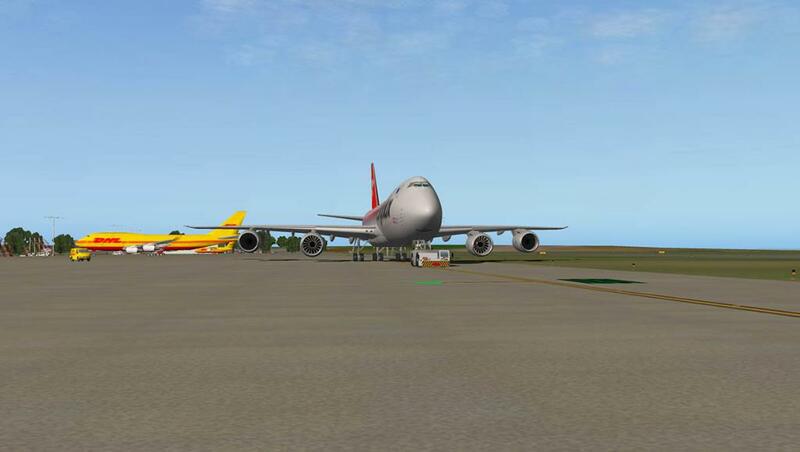 filling your screen as there are not many aircraft of this size you are flying in there except for Peter Hager's A380 Series, This size does give you a strange effect to other items being processed in your X-Plane screen. I have noted this before and it must be considered when using the aircraft. The default B744 is of course a big aircraft, but it does not have the complexity or sheers numbers and pixels in its design as you have here. 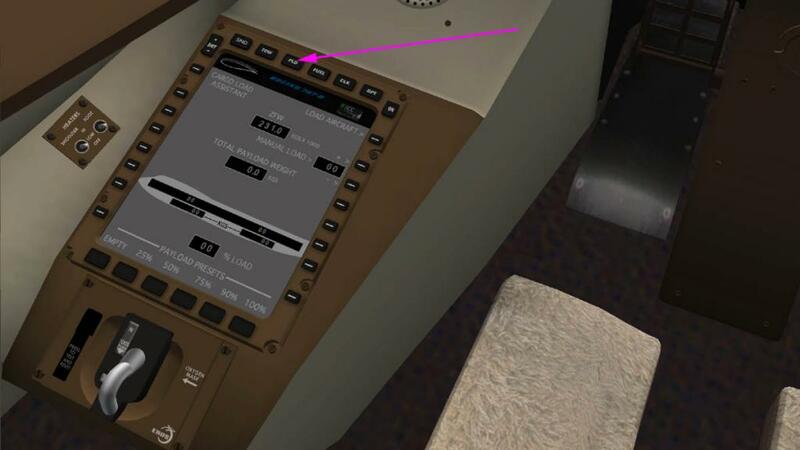 This is reflected in the loading times of the B747-8F, I recorded a time of 4.11 seconds to load from the Quickstart menu in the EGNX scenery, which is the longest I have sat out a simulator load. And change anything and it is well worth your time to go and make a(nother) cup of coffee. 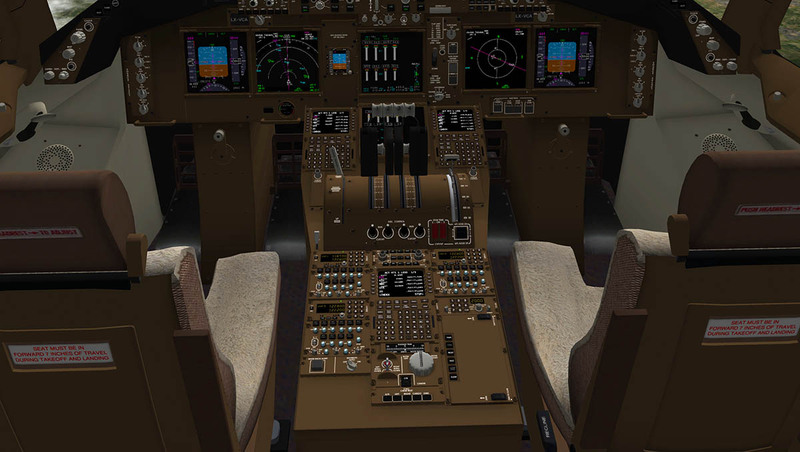 So getting the right set up (or make notes on what they were the last time you used these aircraft) will make your simulation a far better ride. Once done as noted it was very good, if not excellent and I was even able to use the downloaded weather to great effect. High in the cruise at FL300, you cover a lot of ground at m82. France disappeared in a flash, and then I was over EDDF (Frankfurt-Main) and that point on the flightplan was soon followed by LOWW (Vienna) and then into Hungary and Budapest was another past point before starting my descent into Romania and Bucharest (LROP). In cockpit (low but audible) and outer aircraft sounds are very good with the powering on GEnx engines, sounds can be adjusted on the "SND" menu if you want more noise in several areas including the wind, engines and Misc (my guess is background noises)... but I found them perfect. You can use the altitude display to set your descent, I found that the V/S distance half-moon circle perfect for setting the correct point of altitude (5000ft) to the point just before my next waypoint. I totally buggered up my first arrival at LROP on my first run. 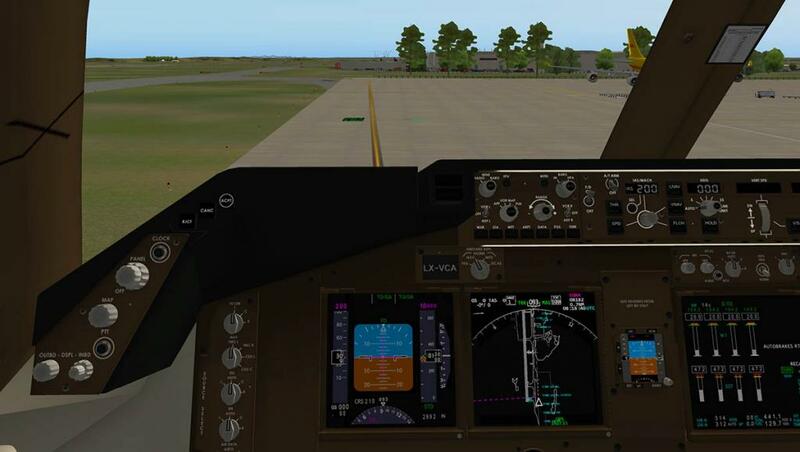 The culprit was the setting of the ILS frequency (110.70) for RWY 26R. On most FMC's your ILS freq is noted not in the top right box of the radio page but located four rows down in the ILS-MLS box. 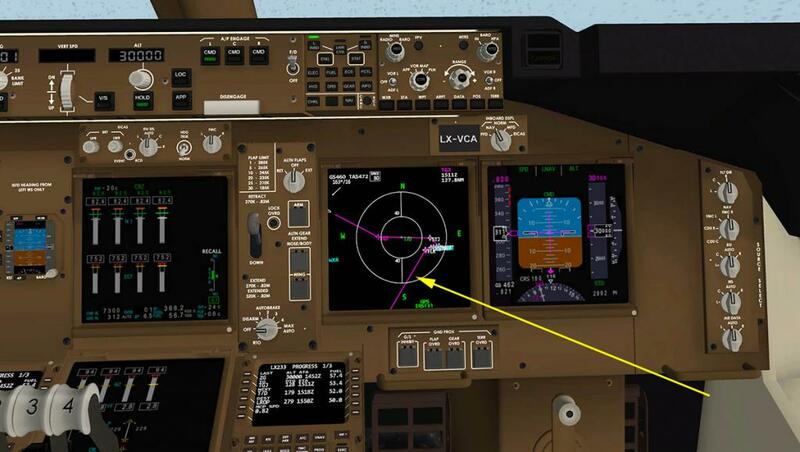 Usually this is a separate freq for the ILS. But here it is, and yes noted in the correct place... but? it is not actually active. You have to reset the freq in the top right VOR L (1) box, and to fail to do this will mean a fail to capture the ILS or runway alignment and a lot of swear words. On approach any high percentage flap movement is very touchy, get any wrong flap and speed position and the nose will rise (the CoG issue). To a point I was ready for this effect and had no real problems as it was just a matter of getting the correct speed right, but if you are not then you could easily stall the aircraft. 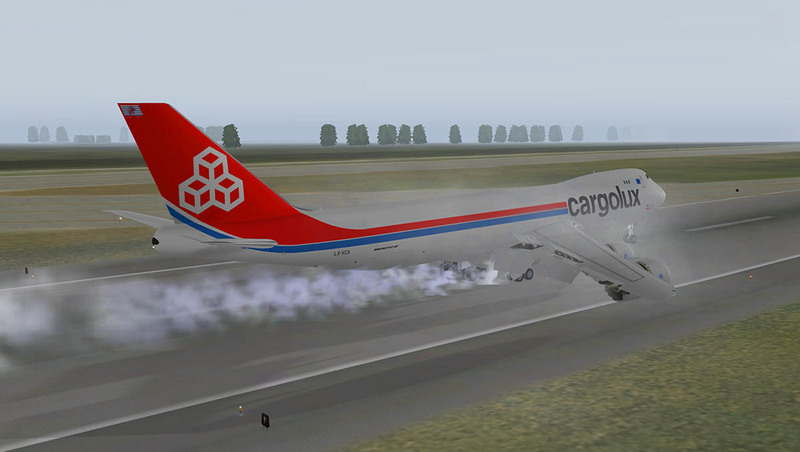 Braking action was set to 4, and speedbrakes armed... 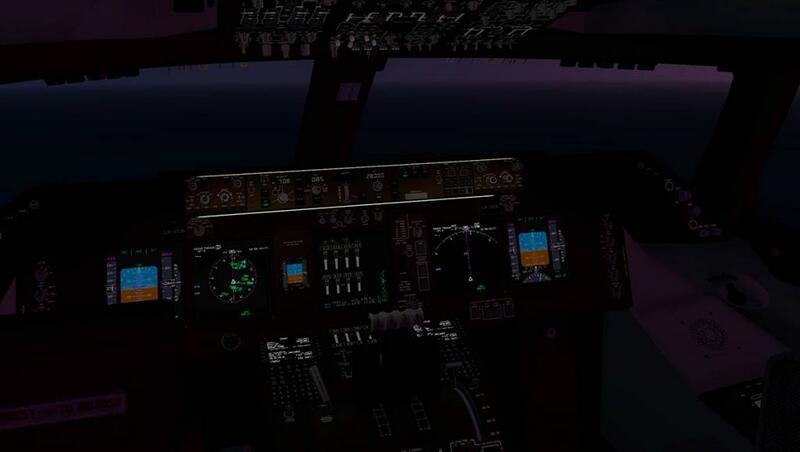 I crossed the threshold on 175knts. You have to have the thrust-reversers set to just open the doors as the B747-8F has a throttle action to provide the required thrust you want (very nice). The runway was wet in this case, but the nose was hard to keep down and even on the runway under-braking and REV action you had to work hard to keep the nose gear touching the hard stuff. power off and rev-doors closed and you are at a taxi speed. 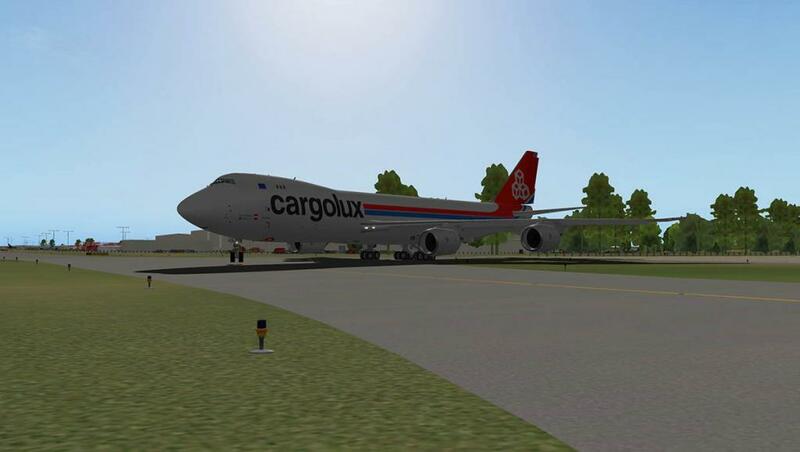 The aircraft felt the size it is here and the usual parking areas for cargo at LROP were too small for the huge 747-8F, so I had to park it out on the main apron in front of the terminals. 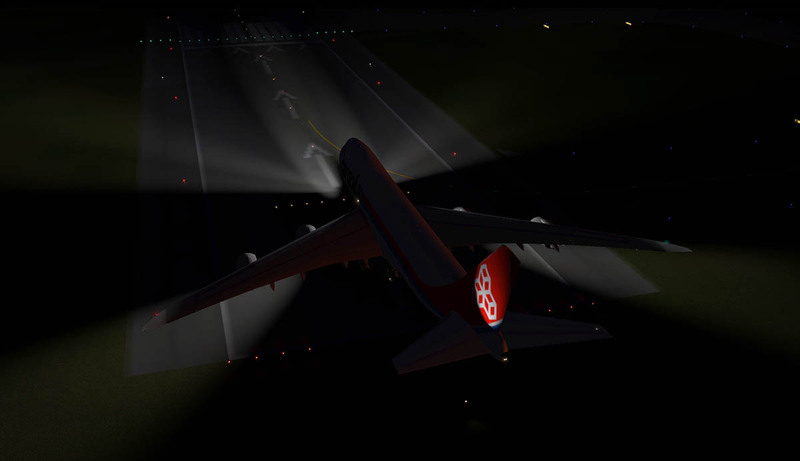 Lighting : External lighting is excellent, with inboard and outboard landing lights (wings) and taxi lights and very effective runway turn lights on the front gear. 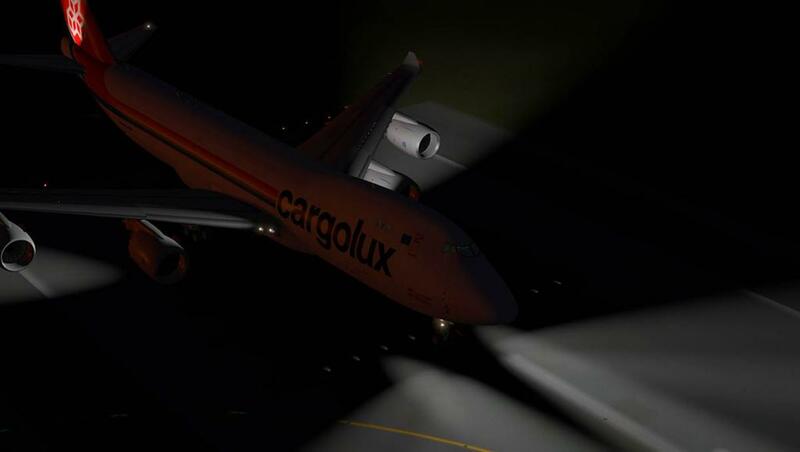 Wing (ice) lighting is also very effective as the engines glow in the dark, logo, double-beacon (upper/lower selectable), strobe and nav lighting is all noted. 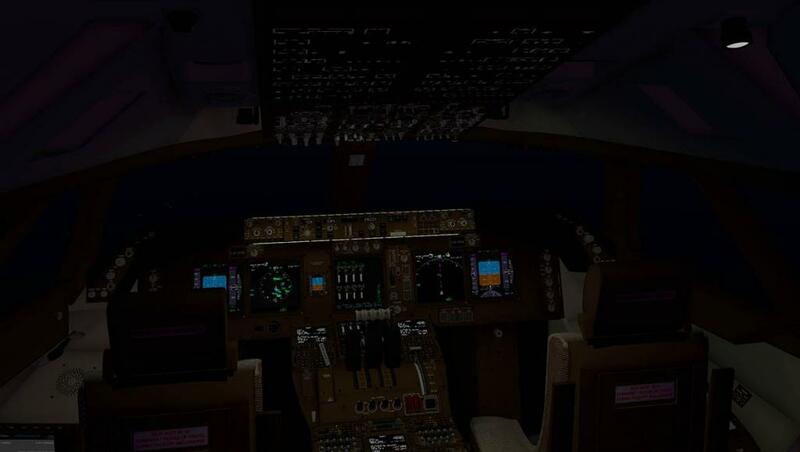 Internal lighting there is a lot of adjustment, there are five overhead lights (adjust together) that fill the cockpit with flood lighting, and turned down the panel lighting can be set perfectly for landing or takeoff roles. Primary Flight Display and MAP displays are adjustable individually. Summary : If you want the biggest, newest and best cargo hauler around then the Boeing 747-8F is it. SSG have provided the best perfect logistic mover yet, with not just the opening doors but also in the way of loading in and unloading that valuable money making freight weight, pallet by pallet. Plus you have the ability then to move it across continents or to simply anywhere in the world (if the airport your heading to is big enough). It is a big aircraft, to use and to fly, but easier to taxi and move across the world than you think. 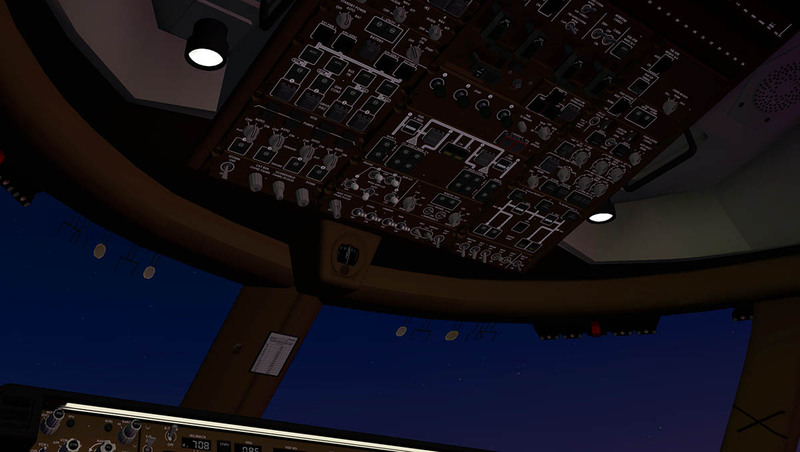 A full FMC routing and preferences access give you the ability to perform and get deep into the aircraft. 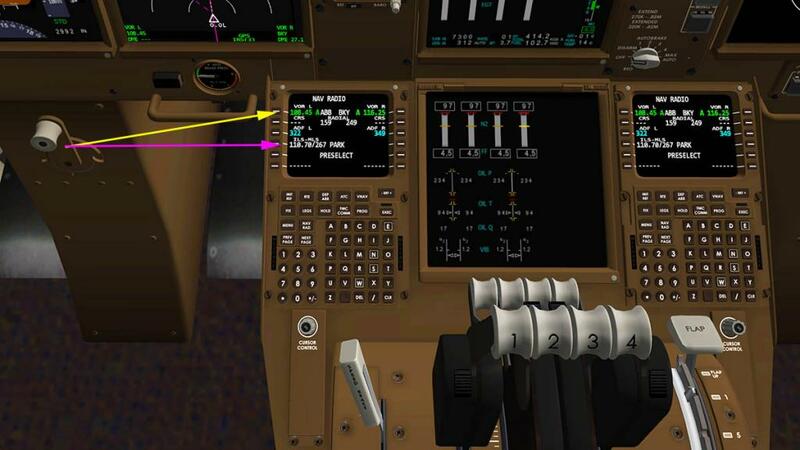 It is not the easiest aircraft to set up for flight and set up in the simulator itself if you don't have a powerhouse graphic computer, but once done, then it does perform very, very well, and yes it will fly on a machine like mine very well. So the B747-8F is not for the novice. 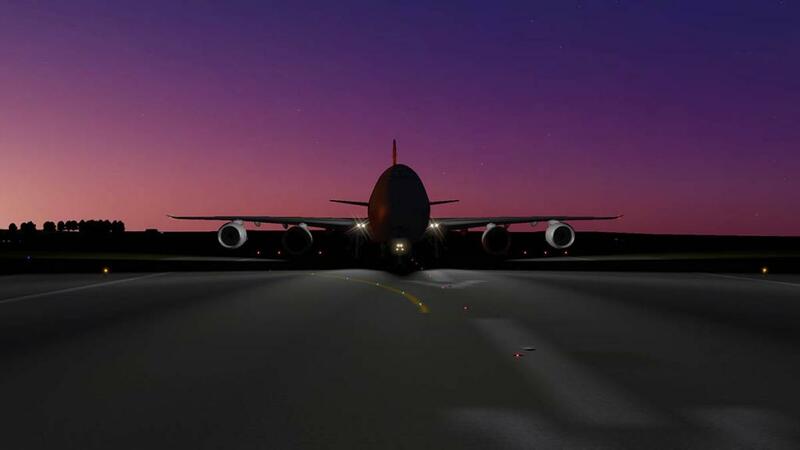 You will need a bit of (very) heavy aircraft and FMC programming experience to get the very best out of these big Boeings, but it is very rewarding when you do. I did note a few small issues like the FMC still has those smaller bugs, but they don't really hinder your routing if you program the FMC correctly. and I simply wasn't happy with the Center of Gravity positioning, Is it adjustable? 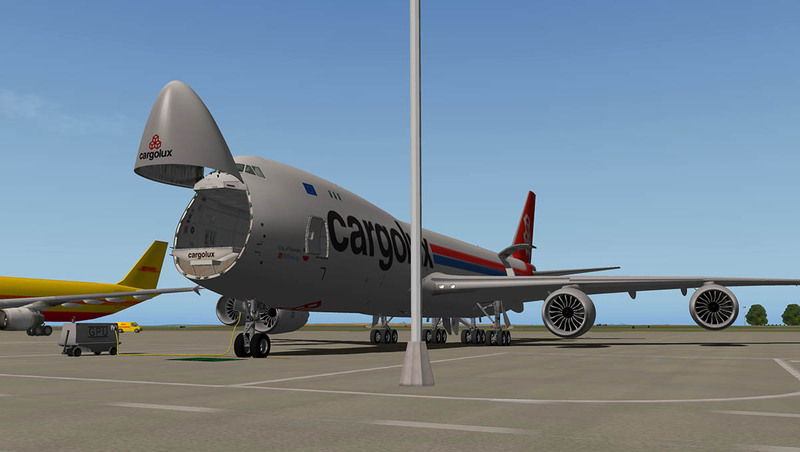 Different cargo weights need CoG adjustments and you have to compensate for that. 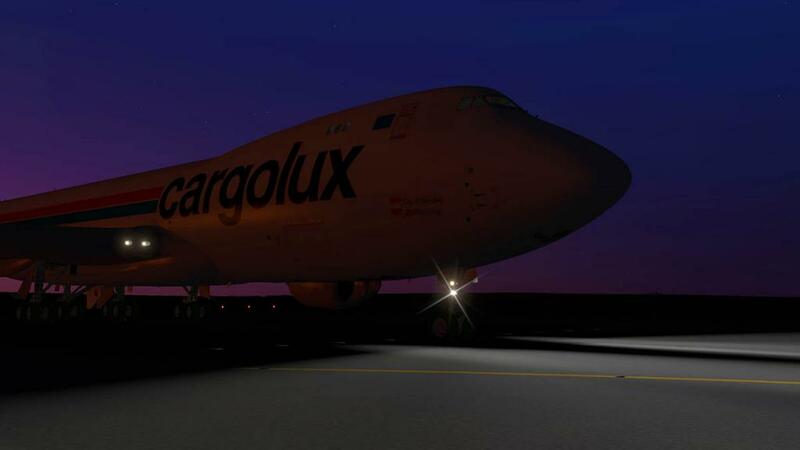 But these are very small issues in the whole scheme of things, Big Jets require lots of flying and experience and this freighter is of no exception. 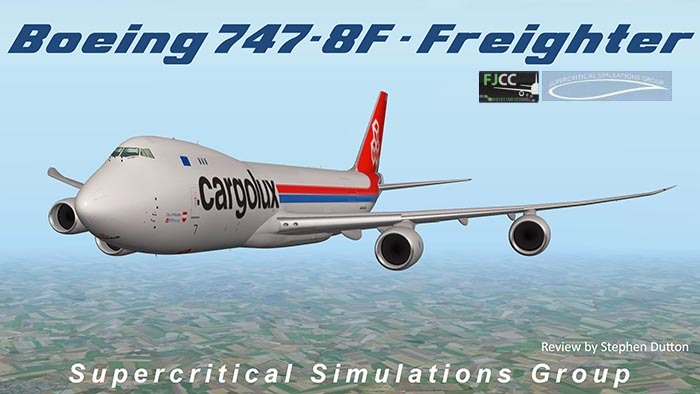 In a year both the B748i and this newer F-Freighter version from Supercritical Simulations Group have come a very long way and are now both very good aircraft. A great investment, but my preference is for this freighter version as it gives you a better experience in long distance freight hauling and I have more reasons to use that ability than using the services with the passenger version, that is a personal choice mind you, but in that case I also had wait longer for this freighter to do those sorts of routes and services, but the wait was certainly well worth it. Download is 325.40mb (expanding to 613.30mb on disk). just drop into your Aircraft folder and the activation (key) is required. 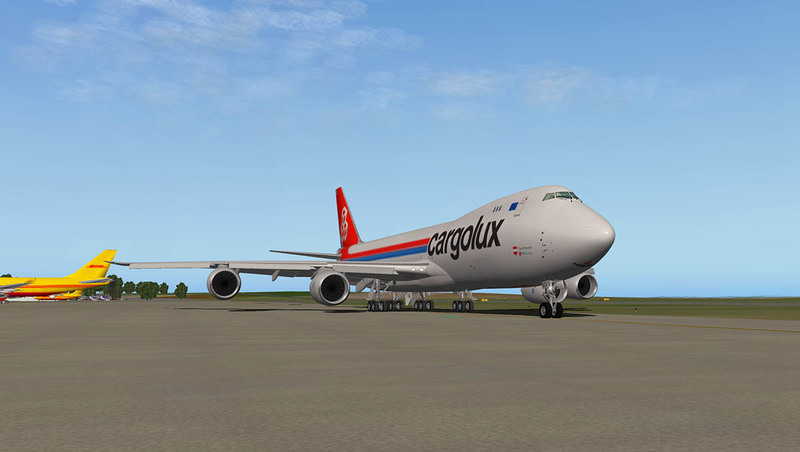 Important Notice: If you have already purchased the SSG B748i Inter Adv, then you are then eligible for a US$20 voucher off the Freighter version, see the X-Plane.OrgShop for details. - Added DreamEngine sound plug-in for improved sound effects as well as sounds professionally recorded from the real aircraft by Turbine Sound Studios. 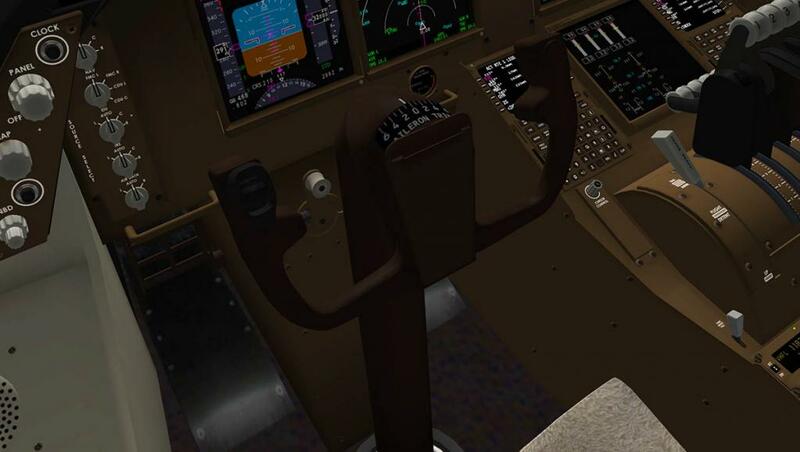 - Hydraulic system has been improved, and unpowered control surface behavior has been added. - Fixed “Recall” button and message logic. - Added seat belt sign logic. 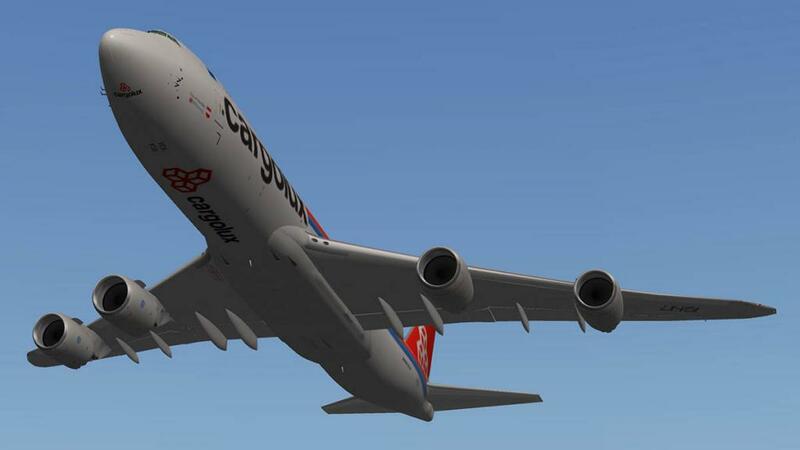 - Some flight dynamics improvements. 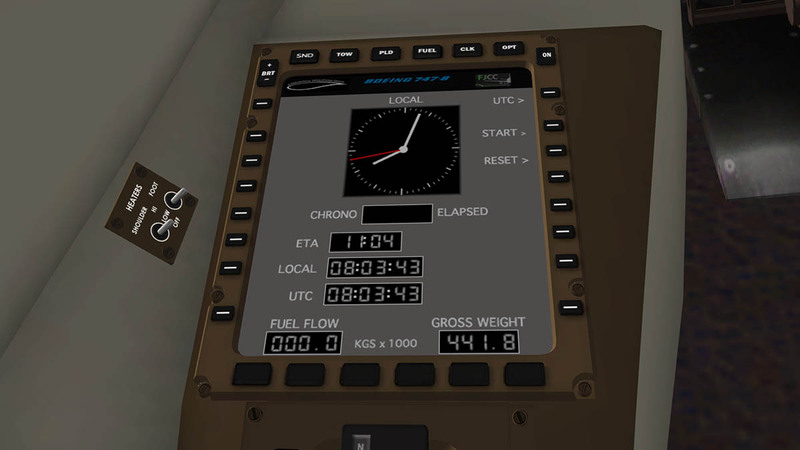 - Added option to use kilos and pounds for cockpit displays. 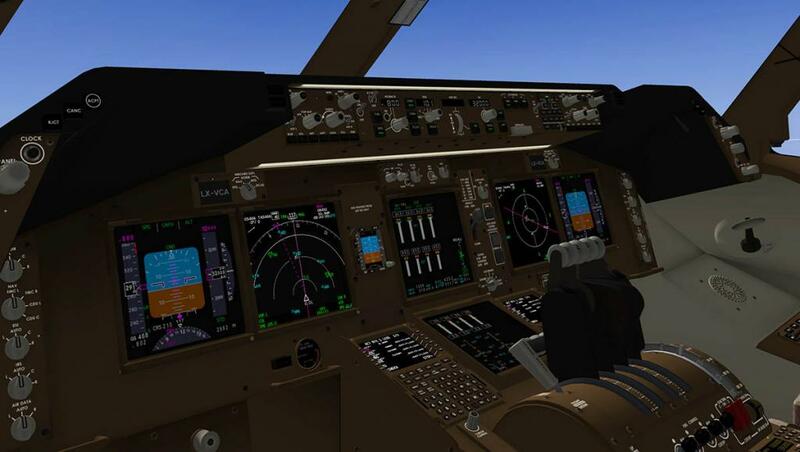 - Added new copilot side Navigation Display pop-up capability. - Added a resizable pop-up FMC. 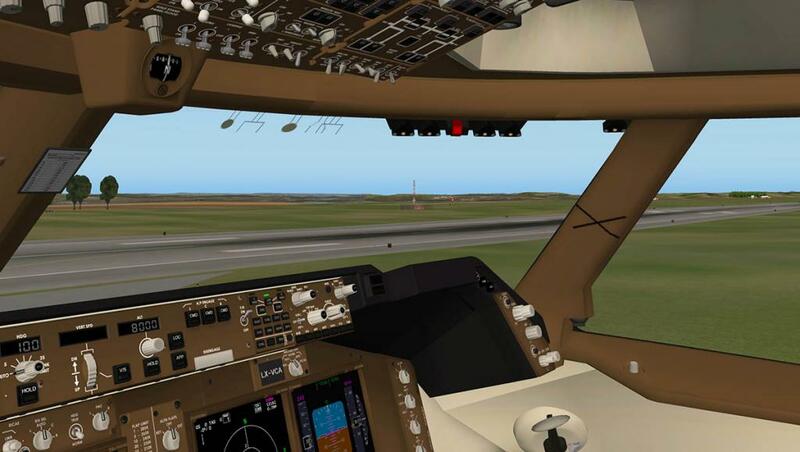 - Many FMC and autopilot issues fixed. - Updated default , Lufthansa, Air China, Korean Air, BBJ, Boeing blue and extra KLM fictional Liveries. 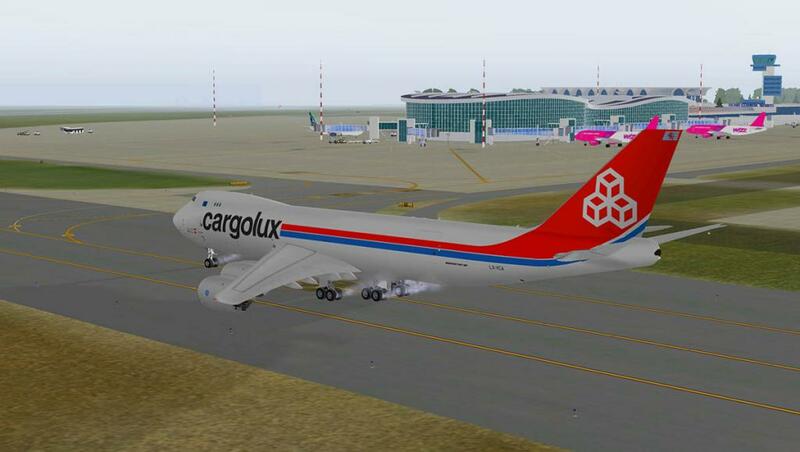 All these updates are also standard for the newly released Freighter version. 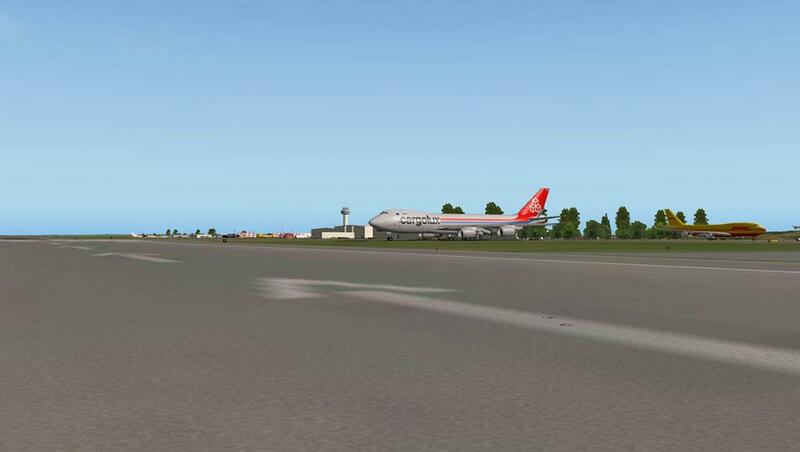 If any aircraft is debatable it is the SSG Boeing 748F. 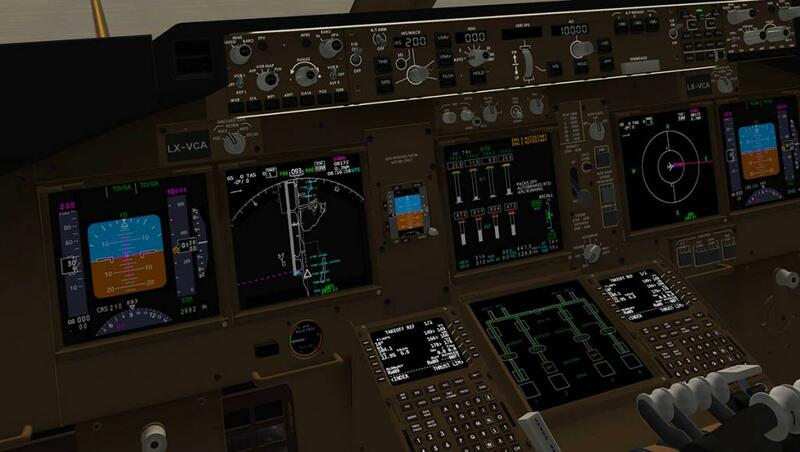 Many users love it and many don't, It is a very deep immersion aircraft with systems and FMC so you have to be prepared to invest a lot of time to get the best out of the aircraft, it is very good... but if you are a casual flyer then I would say no. 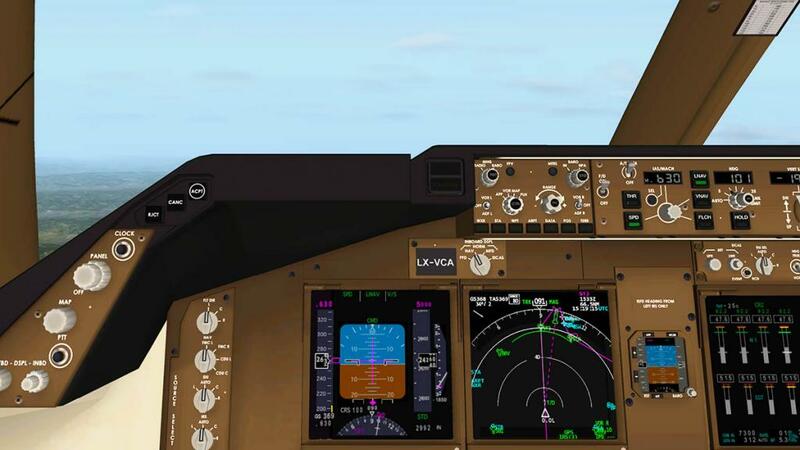 It is frustrating to the user that cannot really understand its systems and heavy aircraft flying profiles, you need a pretty powerful computer as well to get the best out of it. One comment is acceptable, but if more continue I will delete them all as spam!